Bill shock has been eradicated for Australian homeowners, with $0 power bills and a 100% reduction in the cost of power the new normal, with the first sonnenFlat bills being received by customers this week. The first of which has been guaranteed to save more than $2,500 on electricity this year alone, thanks to a new frontier in battery power technology, reveals Natural Solar, Australia’s leading solar and battery installer. The technology has been developed by sonnen of Germany, the world’s biggest producer of solar-charged household battery storage systems. Stephen Fenech, who was the first ever Australian recipient of the sonnenFlat system installed in late 2017, has received his first power bill since changing to this challenger retailer, with the final price of the bill totalling $0 for the 34.75kWh/day of power consumed. Previously, this volume of usage in a one-month period would have equated to new electricity charges of $291.54. Instead, the next generation of power in Australia will see households like Fenech’s pay a simple monthly administration fee of just $40 and negating the need for costly grid connection services coupled with the ever-rising price of power. 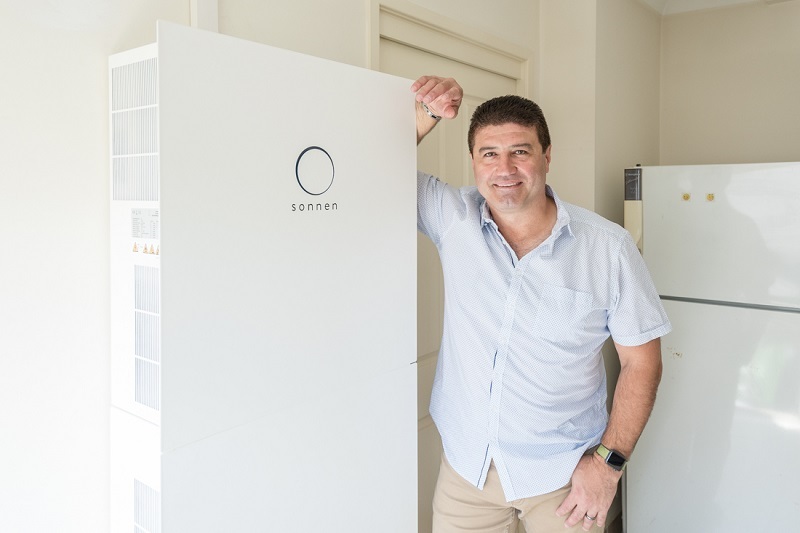 Billed as the ‘utility of the future’ sonnenFlat is the first energy solution of its kind in Australia acting as both a home battery storage solution but also an energy retailer, giving it the ability to guarantee consumers’ savings. Making up almost one-quarter of the global battery market, sonnenFlat provides an annual consumption allowance and no supply or network charges to each home for a small fixed monthly fee. This off-sets increasing electricity prices from traditional retailers, and ensures consumers are maximising the benefits of battery power in their home. Given the power price hike that occurred in mid-2017, the Fenech family’s power bills were expected to skyrocket to $3,005.95 in 2018, based on usage over the past 12 months. With the Fenech family previously paying $2,457.56 for the cost of power in 2017, and $840.12 for the corresponding quarterly electricity bill last year, the sonnenFlat system guarantees a total fee of only $40 per month for this household. The sonnenFlat plan translates to a monthly saving of $210.49, an average quarterly saving of $631.47 and an annual total bill reduction of $2,525.88. Over the lifetime of the system, the Fenech household is expected to pocket more than $50,517.60. “There’s been a surge of interest in the concept of battery power over the course of the past two years, with many consumers drawn towards technology innovation as well as the potential savings,” says Chris Williams, CEO & Founder of Natural Solar. In the case of sonnenFlat, sonnen pays the residual power bill and in return the household pays a flat fee of $30, $40, or $50, depending on their energy usage, with sonnen taking all of the risk on future energy price rises. The Fenech household was previously paying $0.85 per day for a daily supply charge from the network to access power, with the price jumping by almost 10 cents to $0.945 from 1st July 2017, equating to $379.40 (including GST). The eradication of this daily supply charge through sonnenFlat means major savings available for consumers, coupled with risk-free solar and battery power and certainty against inevitable annual power and supply price-hikes. “It’s refreshing to see a battery manufacturer and electricity retailer that is aligned with Australian households by providing $0 electricity bills, which is what our Natural Solar customers want. Ask most Australians and I doubt they will speak of their electricity retailer favourably. Our customers are head over heels with the concept and the proof is now in the numbers. From just $360 per year, sonnenFlat customers can both power their home and access the network, compared to a regular household who pays $379.40 for network access alone, before they even outlay a cent for their electricity usage,” says Mr Williams. “sonnenFlat is a real game-changer for both savvy consumers and the battery industry; this technology means consumers are no longer at the mercy of unscrupulous energy retailers. It’s truly putting the power back into the hands of the consumer and guaranteeing them consistent savings; it’s risk free solar and it’s truly a win-win!” said Mr Williams. Stephen Fenech, very happy Natural Solar customer standing next to his sonnenBatterie which allows him to take part in the sonnenFlat energy tariff scheme from sonnen. For the Fenech household in Sydney’s Eastern suburb of Pagewood who last year, paid a quarterly average of $614.39, this is a drastic change for his current consumption of 34.75kWh which costs just $40 monthly and still manages to power his two-storey four-bedroom home, with three bathrooms, fully ducted air conditioning, a dedicated high-end home theatre system, 4K projector, four TV’s, two fridges, a large washing machine and dryer and a home office with multiple computers and four monitors. The Fenech system includes a 7.56 kWp solar system coupled with a 10kWh sonnenBatterie. The German designed and manufactured sonnenBatterie is made using advanced lithium iron phosphate chemistry, the safest and longest lasting with a 20-year design life and 10,000 cycle guarantee. This is superior technology to the standard LMNC chemistry used by other manufacturers in market. Prior to installing a sonnenBatterie and making the switch to sonnenFlat, it cost the Fenech household an average of $8.24 per day to power this home. The first bill of its kind in Australia shows a daily saving of $6.93, with the daily cost plummeting to just $1.31. Based on this initial monthly bill, the sonnenBatterie home energy storage solution will have an ROI of 6.85 years with the battery expected to have a life-span of up to 20 years. “For the average household, approximately $2,000 of the annual budget is allocated to power bills, making the need to explore alternative energy options and battery storage mandatory. At Natural Solar we are seeing more of our customers demand stability and certainty and flock to innovations such as the sonnenFlat which do more than just store power, but also guarantee savings, making solar risk-free for many homeowners. It is all about added certainty in an environment of skyrocketing electricity prices,” commented Mr Williams. “This isn’t a fairy tale, sonnenFlat is simply the future of energy which cuts out the middle man and gives power direct to consumers. sonnenFlat is like a mobile phone plan for electricity which means households can budget for their power usage. It’s the guaranteed antidote to bill-shock and what Australia truly needs to progress,” says Mr Williams. sonnenFlat $0 electricity bills are now here! Enter your details below to get an instant quote!